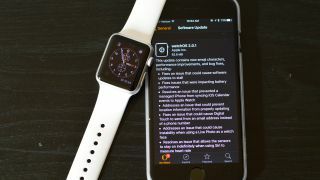 There's a new watchOS 2 update - or watch OS 2.0.1 - for the Apple Watch today that should fix several problems afflicting the smartwatch. Most importantly, it appears there's a fix for "issues that were impacting battery performance." Apple didn't specify what the issues were, or say how much longer the battery should last. Other bugs the update should have squashed relate to Apple Pay security, stalled software updates, location information updating, Digital Touch, instability with Live Photos on watch faces and several other security measures that Apple seems to have locked down. The update is 62.8MB and should be live once you open the Apple Watch app on your iPhone. Then head to General, Software Update, enter your passcode and agree to the terms. Depending on your Wi-Fi connection, it should only take 15 minutes or less to download and install. Oh and aside from the fixes, there are new emojis. OS X 10 and iOS 9 are also getting updated today. Will next year's smartwatch batteries be better?